The warmer and longer days are likely the reasons but Mondayitis isn’t as bad this morning. Maybe it was the thumping victory Hawks enjoyed over the Crows on Friday night, as I listened to the game on the Hume. It was a good 3 hours into my drive before the game started and I had been listening to some podcasts of NT Wright before that so it took some adjustments. Listening to talks that force a re-framing of how one views so many parts of scriptures puts one in state of mind which causes reflection and reconnecting an array of thoughts. Switching then to a footy broadcast soaked in adrenaline fueled descriptions of physical battles, required some mental gymnastics. At least it kept me awake and interested for the rest of the drive. The 74 point margin apparently reinstalled the Hawks as favourites for the flag but we all know footy is filled with superstitions. I reached home to be warmly greeted by Tress – as always – but this time the warmth was spiced with some very delicious noodles which she had bought earlier that night. Home sweet home indeed. Maybe it was a warm, wonderful Saturday. After brekky I had intended to drop into Bunnings to get some “feed and weed” stuff for the lawn but Tress and I agreed it needed mowing again so we pottered around to wait for the moisture to dry up. Tress had also presented me with a new iPad mini so I tried to set it up and install the new iOS9, and I let the installation process run while Tress and I went outside – it was a sunny morning that was rapidly warming up. She weeded, I washed the car, mowed the lawn and when it was all done it was noon and we headed to Madam Kwong’s. After lunch we did some grocery shopping – Tress was going to do a fruit platter and I was planning on a salad for dinner at Gerry and Jessly’s that night. We then took the little fellow for a walk, then went to see out optometrist for our eye checks. Tress needed new sunnies and my 3+ year old multi-focals weren’t working well for me anymore. Another reminder I was turning 50 the next day. It was very good to meet up with that bunch for dinner again, to top off Saturday. 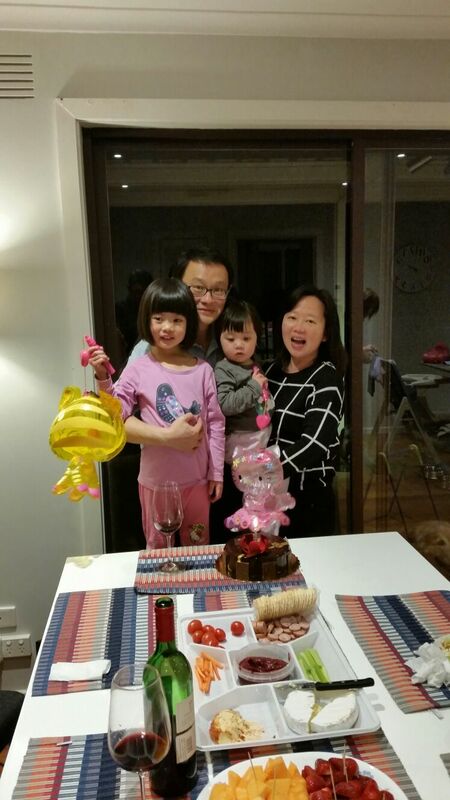 Gerry and Jesslyn with their girls were joined by Jesslyn’s brother and his family, as well as Poh Mama – Jesslyn’s mum – who had arrived earlier that day from Singapore for a short holiday. Jason and Mel were there too and it was the first time we had met up since I left for Canberra. The meal and company were very good. I had brought along a bottle of 2000 Penfolds which was thoroughly enjoyable. Maybe it was being back at St Alf’s on Sunday morning. Not for the first time, being back there I felt at home again. Maybe the recent church finding experience in Canberra has heightened this sentiment, but just seeing familiar faces and talking to some of them and listening to Peter talk about how God cherishes and love his people in spite of our unfaithfulness, was very settling for me. It sort of informs how I view my relationship with Tress. Maybe this was also swirled by the NT Wright podcasts I had been listening to. In as much as I love Tress, it is only a taste of how much God loves His church. Why the church continues to court the world and tries to please it instead of pleasing God, its more deserving and rightful groom, is just testament to how fallen we are I guess. This is a new world for me – seeing God’s work, His kingdom, the church and its role and responses, all from new perspective. It’s all just opened up and will take a while for the numerous strands to connect, form and settle. I hope to be able to continue reading/listening. At lunch at Madam K’s after church, I said to Tress I so want to return to Melbourne and I hope I’d find work in Melbourne again soon to let that happen. She said to give it time. I used to advice new migrants to give it time because their comfort in Malaysia was a culmination of years of hard work and making connections. Their new life in Melbourne required the same elements. I’ve not been following my own advice. Maybe it was the 12 month frame which made this more challenging but I really should give it time I guess, before I can cease to look to returning to Melbourne for my fortnightly dose of happiness. Maybe it was having LBJ next to me on the way home last night. The little fellow was a model passenger, as he lies down on his bed on the passenger seat next to me the whole way from Vicki Street, Forest Hill, Victoria to Watson Street, Turner ACT. When we finally arrived, I took him across to Haig Park for a walk for him to do his thing, before taking him up to the apartment and unloading and unpacking. Kiddo and Mic came back from church earlier than expected and we talked as Kiddo fussed over LBJ. The whole scene was far better than my usual Sunday night returns to the flat – being alone and wondering why I was doing this. Maybe it was because Tress’s coming up again on Friday. She’d fly up after work, and we’d head to Sydney for the long weekend. That’s something to look forward to. Whatever the reason – and it is likely all of them – Mondayitis this morning isn’t as bad as it often is. And oh, United won overnight too – coming from behind to beat the Saints away and get back to No.2 on the ladder. That helped.